Not only is Mt Ruapehu the North Island’s highest mountain, it is one of New Zealand’s most famous peaks. 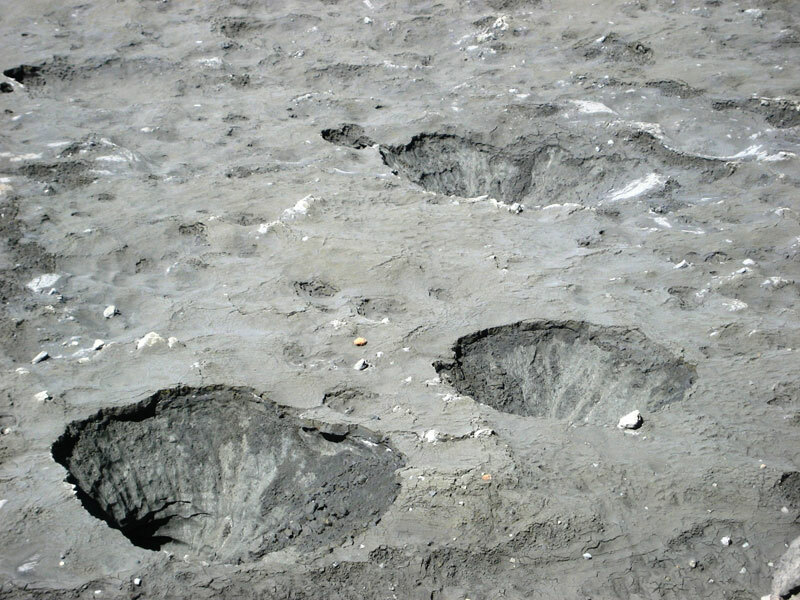 Ruapehu has repeatedly featured in international news media, due to spectacular eruptions in 1995 and 1996, and a Crater Lake break-out lahar (from a tephra dam collapse) in 2007. Earlier, on Christmas Eve 1953, 151 people died after a break-out lahar washed out a railway bridge, and caused a passenger train to plunge into the swollen river below. The mountain is also home to two of New Zealand’s busiest ski fields, Whakapapa and Turoa. A day tramp to Mt Ruapehu’s summit is a memorable experience and the views over the crater lake are remarkable. Be warned however, that the tramp to the Dome summit is an unmarked route, and we highly recommend that you take the guided trip. Please note that the highest point of Ruapehu is Tahurangi summit, at 2797m. 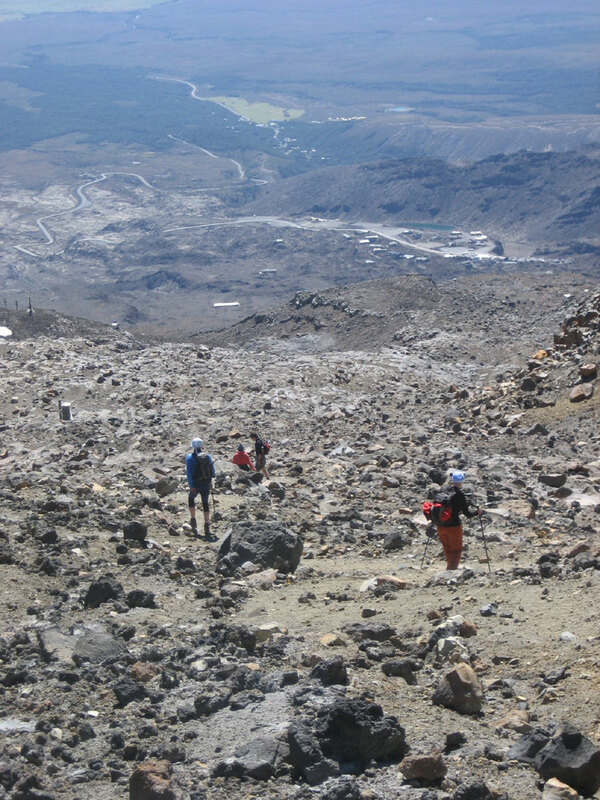 The highest point for trampers is at Dome summit however, and therefore bagging Dome summit is enough to have ‘bagged Ruapehu’. To get to Whakapapa Village, simply take the turn off from State Highway 47, and proceed to the carparking available in the Whakapapa Village. The information centre is on the left of the road, just past the Grand Chateau. There are a number of shuttle services which take visitors to the Tongariro Alpine Crossing at Mangatepopo, but it is worth enquiring with them about Whakapapa Village drop offs. If it is summer, and you are experienced and equipped, you can tramp to the top of Mt Ruapehu under your own steam. To do this you need to take the relevant topographic map, and have the navigational skills to find your way from the top of the Waterfall Express chairlift, along Knoll or Restful Ridge, and up Dome Ridge to the summit. This track is only recommended when the mountain is clear of snow and ice. Also, be aware, that the route is unmarked (and not obvious) especially on the way down! Although we have listed this route as only 5.6km long, it is likely to be a great deal longer than that, as you will spend a lot of time zig zagging around and over rocks. 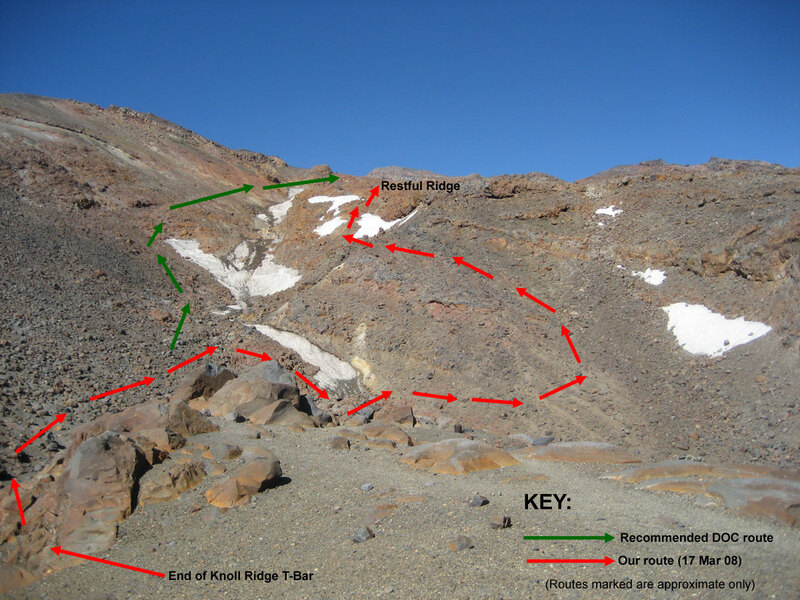 The route marked on the topographic map on this page is the route we took on 17 March 2008 (via Knoll Ridge), and it is the route we will describe here (and not necessarily the easiest/best route!). An alternative route is via Restful Ridge. An important point to note is that the Ruapehu topographic maps do not represent many of the steep cliffs that are present on this tramp – what look like reasonably gentle (but steep) contour lines, are actually rocky bluffs which drop away very quickly. After visiting the Whakapapa Information centre (where you can check the weather, fill out an intentions form, gain route advice, and confirm the ski lifts are open), drive to the top of the Bruce Rd to purchase your ski lift tickets ($20/adult). There is a carpark, as well as a cafe and toilets here. It is possible to walk to the summit all the way from the top of the Bruce Rd carpark, but if the chairlifts aren’t running, it’s a good indication you shouldn’t be up the mountain! Take the two chairlifts up to New Zealand’s highest cafe, Knoll Ridge Cafe, at 2,020m. On the night of Friday 13th 2009, a fire burned the Knoll Ridge cafe to the ground, but has since been rebuilt. All firefighters could do was watch from a distance, as there is no road access to the cafe. 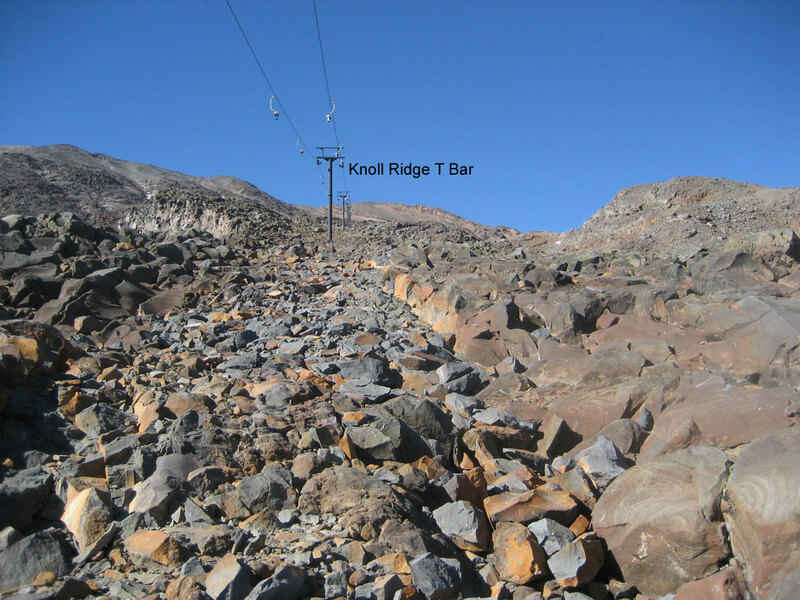 From the end of the Knoll Ridge chairlift, head directly off the lift platform and sidle around the rocks to the right, up on to Knoll Ridge, under the Knoll Ridge chairlift (which does not operate in summer). Follow the ridge all the way up by walking directly under the chairlift – although rocky, it is not excessively steep, and the chairlift makes for easy navigation. At the end of the chairlift, you will see a glacier in the valley ahead of you, and a stream heading down the valley to your right. As the ridge drops away sharply to your right, you need to descend off the top left of the ridge, and then sidle around to cross the stream. From here the going gets steeper, as you climb up the ridge and pop up on to the top of Restful Ridge. Though it looks intimidating, if you head diagonally up the side of the ridge, you will gradually make progress towards clambering up on to it’s flatter top. (We noted later however, the recommended DOC route does to the left of the glacier, not to the right as we did). Once up on the ridge, you need to aim to the right of Glacier Knob, and as you get closer you will begin to see a track leading up the scree to the summit plateau. 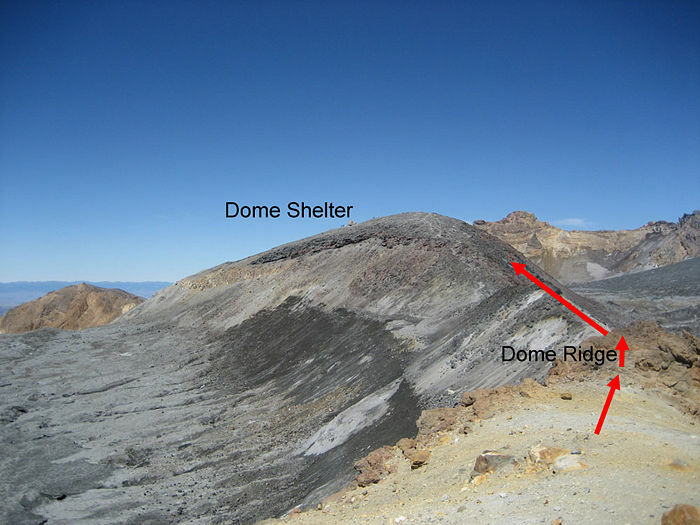 At the top of this track, you will catch your first view of Dome Shelter, and you will be able to see the route along the narrow Dome Ridge. Carefully navigate Dome Ridge and then climb up on to Dome Summit, where you will get stupendous views of the crater lake. The chair lifts close at 4pm, so don’t loiter at the summit for too long, as you will want to make it back in time! Allow yourself at least two hours to get back to the Knoll Ridge cafe and chairlifts. We strongly advise that you do not attempt to make it a loop journey by descending via an alternative route (as we did). There are many rocky fingers and their steep drops are not apparent until you reach the edge of them, by which time you need to backtrack upwards and find an easier way down. Also be aware the cairns along Restful Ridge seemingly lead nowhere useful when descending! If you come up Restful Ridge, and know where to get down again, they may be of use, but they seemed to lead us to steep cliffs we didn’t fancy going down. We spent much of our descent wishing we had returned via exactly the same route we had come up – and consequently we missed the last chairlift by 10 minutes! We tramped Ruapehu on a perfectly clear cloudless day, and still had some navigation difficulties, so if mist rolls in, we advise you to turn back and get off the mountain as soon as possible. If, like us, you miss the last chairlift, you will still face the challenge of navigating your way back to bottom of the Waterfall Express chairlift. Don’t attempt to follow the Waterfall Express chairlift the entire way, as it descends over a rocky cliff. Once you reach the cliffs, head up to the right, where you can follow a fence down gentler terrain. You’ll then need to swing around to your left and zig zag down underneath the bluffs and past a waterfall. You can then follow the chairlift again, where it eventually meets with a road that heads down to the Bruce Rd carpark. 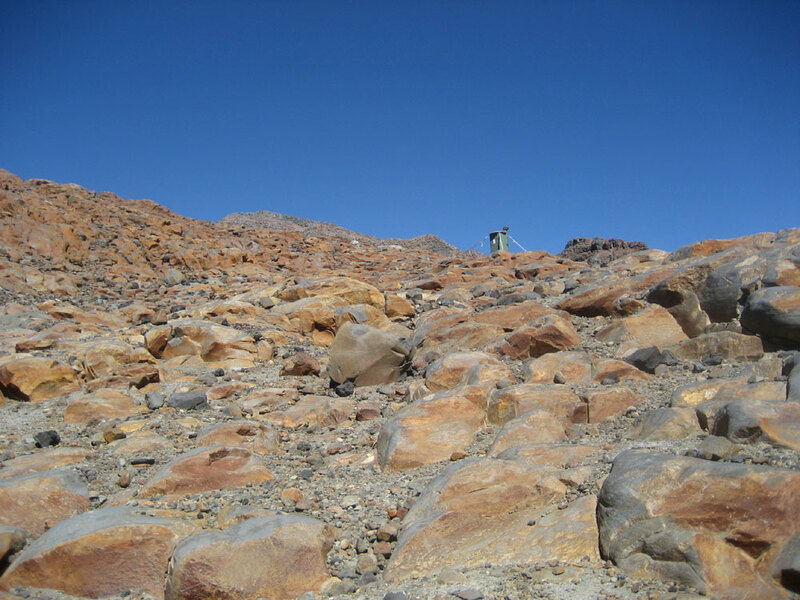 For the DOC self guided route description, and updates on the current volcanic status of the crater, please also consult the DOC Mt Ruapehu Crater climb page. After completing a somewhat less than direct Ruapehu tramp ourselves, we would highly recommend that you take one of the guided tours run by the Whakapapa skifield operators. 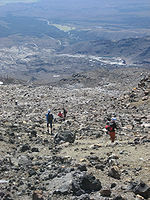 Mt Ruapehu.com run 6 hour group or private walks to the summit (Adults $90, Under 18 $55). By taking a guided tour, you are in the hands of experts when it comes to weather, volcanic activity, and track conditions. You can also hire equipment if necessary. 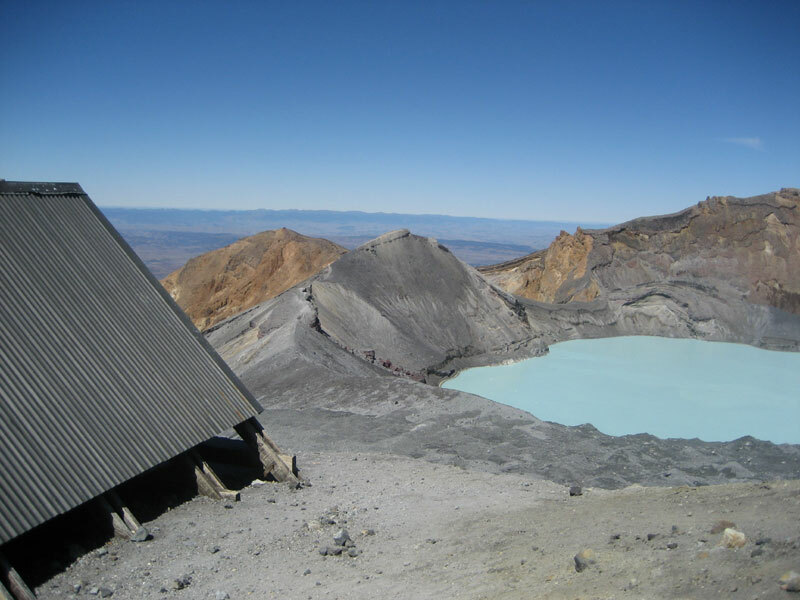 For further information, see Mt Ruapehu crater walk. Mt Ruapehu is located in an alpine environment. From May to Dec it is likely you will find snow or ice on some or all sections of the tramp. At all times of the year, the weather can be very changeable, and many people have needed to be rescued from this environment. You need to take appropriate windproof clothing, tramping boots, and plenty of food and water. You should check local conditions with DOC Whakapapa (07 892 3729) and also let them know your planned movements. If DOC says not to go, do not go! Remember also that Mt Ruapehu is an active volcano, and in recent years has erupted in 1995, 1996, 2006, & 2007 (and frequently before that as well). 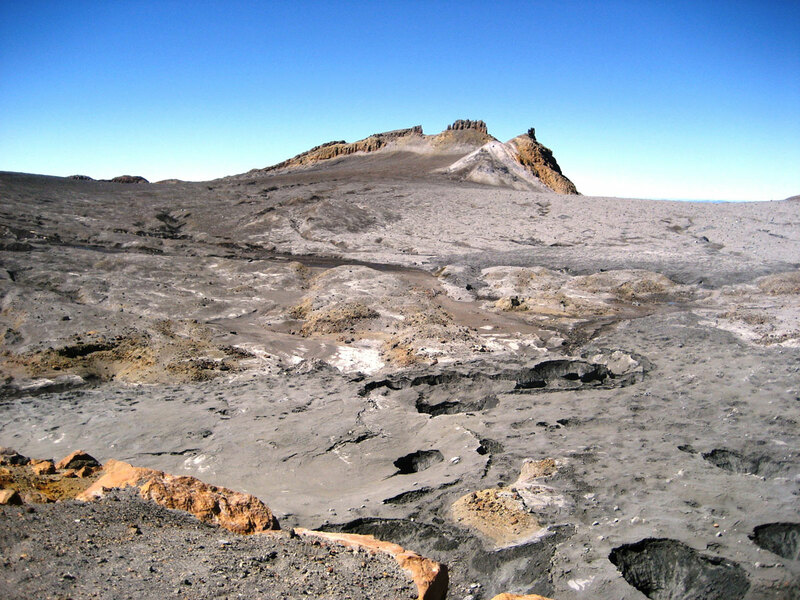 Two climbers had a lucky escape in 2007 when their stay in the Dome summit shelter was interrupted by an eruption. You should not spend long on the summit, and be aware that the area within 700 metres radius of the crater is a ‘High Risk Zone (PDF)’. If you feel an earthquake while on the mountain, get down! Similarly, if the volcano erupts while you are climbing it, get up out of the stream valleys and up on to a ridge, as lahars (mudflows) can sweep down the valleys. You can check the Geonet website (run by GNS Science) for volcanic alert bulletins. Don’t let all this put you off however, as in the right conditions Mt Ruapehu is magnificent! Just make sure you go in the ‘right’ conditions, with the ‘right’ equipment.